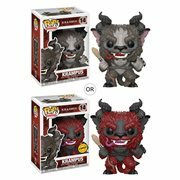 Krampus is a 2015 American Christmas horror-comedy film based on the eponymous character from Germanic folklore, directed by Michael Dougherty and written by Dougherty, Todd Casey, and Zach Shields. The movie stars Adam Scott, Toni Collette, David Koechner, Allison Tolman, Conchata Ferrell, Emjay Anthony, Stefania LaVie Owen, and Krista Stadler. This article uses material from the Wikipedia article "Krampus (film)" and is licensed under the GNU Free Documentation License.